This gorgeous luxury Mothers day card is a wonderful choice for you to send your love to your Mum on Mother’s Day. 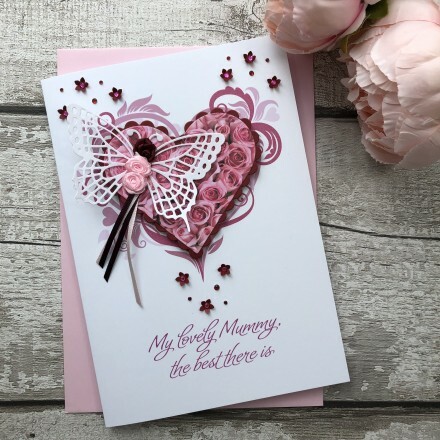 This card features a background image of an ornate pink heart that is decorated with a stunning raised rosebud panel that displays a beautiful rosebud shimmering butterfly. This design is finished with jeweled flowers and sparkling gems. A truly stunning luxury personalised mothers day card is a gift in itself.